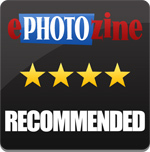 We review the Olympus Stylus SP-100EE - an ultra zoom camera with a 50x optical zoom lens and an innovative dot-sight. 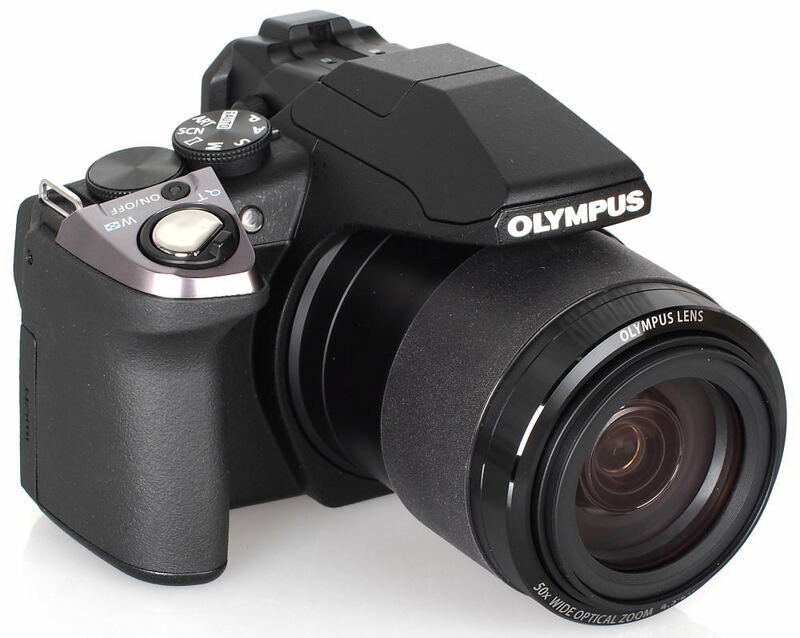 The Olympus Stylus SP-100EE features a 50x optical zoom lens, 16 megapixel backlit CMOS sensor, 3inch screen, electronic viewfinder and full HD video recording. The camera is the first to feature a new "Dot Sight Framing Assist" feature that helps aim the camera at the target. There is also a focus limit button that can help in keeping what you want in focus. The Olympus Stylus SP-100EE features a 50x optical zoom lens with optical image stabilisation that is equivalent to 24-1200mm in 35mm terms. There's also a 3inch screen on the back as well as an electronic viewfinder with dioptre correction to help you compose shots accurately. The camera offers 7fps continuous shooting, as well as full HD video recording at 60fps with stereo sound and optical zoom available. A common problem with many ultra zoom bridge cameras is that while they offer an impressive optical zoom, it is often difficult to keep the subject in the frame particularly if they are moving. Often if you lose the subject, you then have to zoom out again before you can locate it, and then zoom in again to get the shot, this can cause you to miss the shot completely. However, Olympus has introduced a new technology called "Dot Sight" that is usually associated with a sight on a rifle, this lets you track an object through the optical "Dot Sight" viewfinder meaning you can make sure your subject is in the centre of the shot. 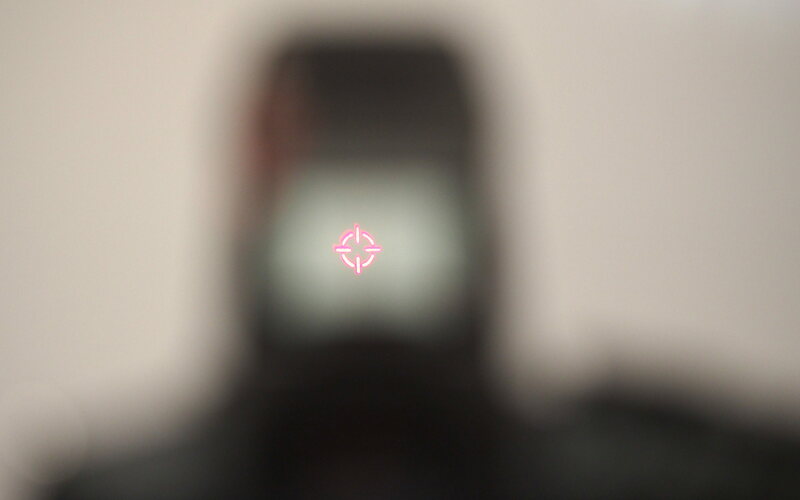 The dot sight feature can also be used for tracking objects when recording video, and there is a focus lock / focus limit button on the side of the camera. The Olympus Stylus SP-100EE has a solid plastic body, with a large hand grip surrounded in rubber, and along with the large rubber thumb grip on the back, it makes it easy to hold the camera securely. There is a rubber ring around the lens barrel further enhancing grip when holding the camera with two hands. Build quality is generally good, although the battery and memory card cover feels a little flimsy, although this shouldn't be too much of a problem as the battery is charged in the camera. The tripod socket is plastic, which shouldn't be a problem, as long as care is taken when using the camera on a tripod. On top of the camera is a mode dial and command wheel to quickly change settings, this defaults to exposure compensation in P (Program) mode. A function (fn) button can be customised to give quick access to your favourite settings. 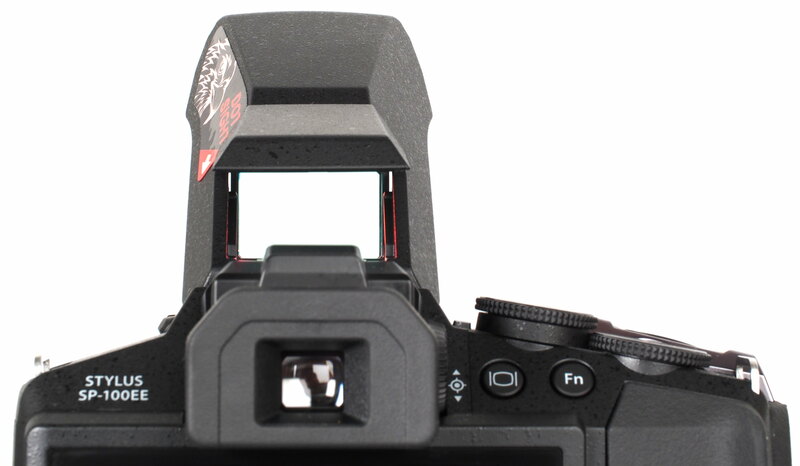 You can use the side zoom rocker control on the side of the lens for smoother (slower) zooming in and out, compared to the zoom control surrounding the shutter release button. 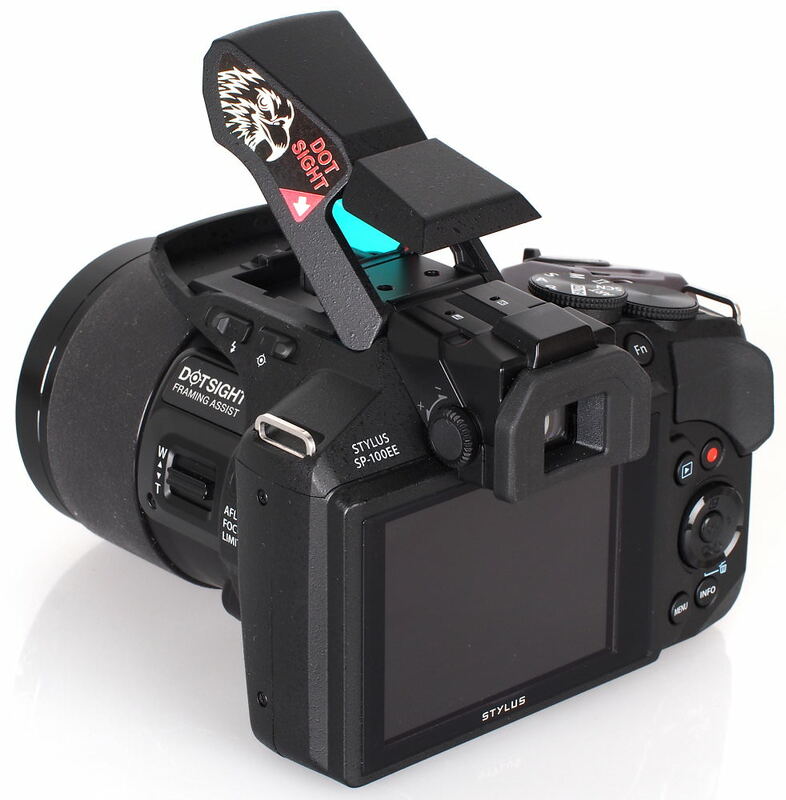 You can also hold the AF lock button and you can set the focus limit to off, close distance, or far distance to aid quicker focus. The screen looks reasonably good, with a 460k dot resolution, although it isn't a gapless design, which means you do see reflections on the screen at times. The electronic viewfinder (EVF) is fairly small, and contrast is quite low, with lower colour saturation when compared to the rear screen. 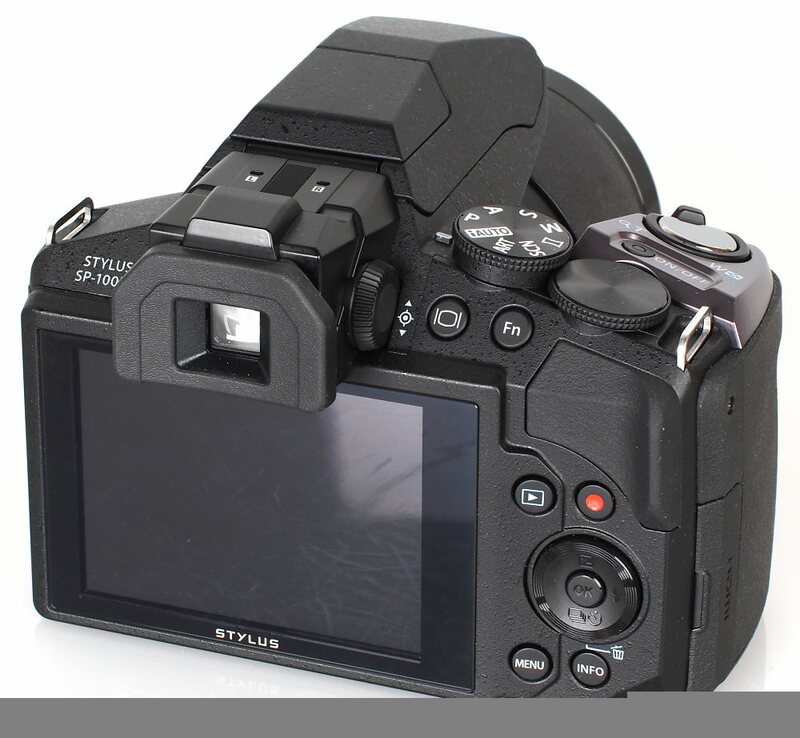 Unfortunately the electronic viewfinder does not feature eye-detection, so in order to switch to the EVF from the screen and vice versa, you have to press a button next to it. The EVF is reasonably comfortable with a rubber eye-surround making it good whether you wear glasses or not. The cross hairs in the "Dot Sight" viewfinder work to target your subject, and this works extremely well when using full optical zoom or nearly full optical zoom. Menus – To change settings you can use the 4-way controller, and the middle OK button, and this will bring up a number of common settings on the rear screen. To adjust more advanced settings you simply press the menu button and the options are spread over a number of screens, and there is built-in help that explains each option making the camera easy to use without having to refer to the manual. Battery life - Battery life is rated at 330 shots according to Olympus / CIPA test results, which is good considering how small the battery is although it has a 1350mAh rating which is quite good. Charging is performed using the USB cable and AC adapter with the battery in the camera. Focus speed is good, particularly when shooting at the wide end of the lens, with a quick shutter response. Shot to shot time is also good, and the camera can shoot at 7fps at full resolution for 6 shots. The camera will also shoot at 2.5fps for 200 shots at full resolution, or until the memory card is full. Sample Photos - Images have good colour with reliable exposure, although detail can seem a little low at times, when viewing images at full resolution. Portrait photos taken with flash show no red-eye, and good colour. Lens Performance - Shooting wide-angle resulted in images being softer on the left hand side of the image, and softer into the corners. Detail was also slightly lacking, compared to other 16 megapixel cameras. Images were soft at the telephoto end when using the full optical zoom. The camera controls barrel and pincushion distortion well, although chromatic aberrations and purple fringing were visible at times. The camera lets you focus on subjects just 1cm away from the front of the lens, although using the Super Macro mode means you can't use the optical zoom while on this setting, and you will need to be careful that the lens doesn't stop light getting to the subject. ISO Noise Performance - For the lowest noise and best detail possible we would recommend using ISO125 to ISO200, as images have low levels of noise and reasonable levels of detail. For lower light situations ISO400 to ISO800 still provides reasonable results, although noise increases and detail is reduced, with images becoming soft. At ISO1600 noise reduction becomes quite strong, although result may still be useful if resized and used on the web. ISO6400 is best avoided as noise is at its highest with low levels of detail. White Balance Performance - Auto White Balance (AWB) performs well with a slightly warm colour cast under tungsten lighting, with the tungsten preset giving an accurate result. AWB performs well under fluorescent lights, with the fluorescent preset giving a magenta colour cast. Panorama mode - The camera features an automatic panoramic mode, where you simply press the shutter release button and pan the camera from one side to the other. Results are good, and well stitched together, although with a fairly low resolution image produced. Digital Filters - There are a number of colour options, digital effects, as well as seven art filters built in that can help give you some creative shots, as shown above. There is an HDR shooting mode, that improves dynamic range, although produced a much less detailed image. Dynamic range can also be enhanced using the built in shadow adjustment technology. Video - Tha camera features Hybrid lens shift + digital (5-axis) image stabilisation for recording video at 1080p, and 60fps, with stereo sound and optical zoom. The lens is relatively quiet when using the optical zoom while recording, but is still picked up by the internal mics. 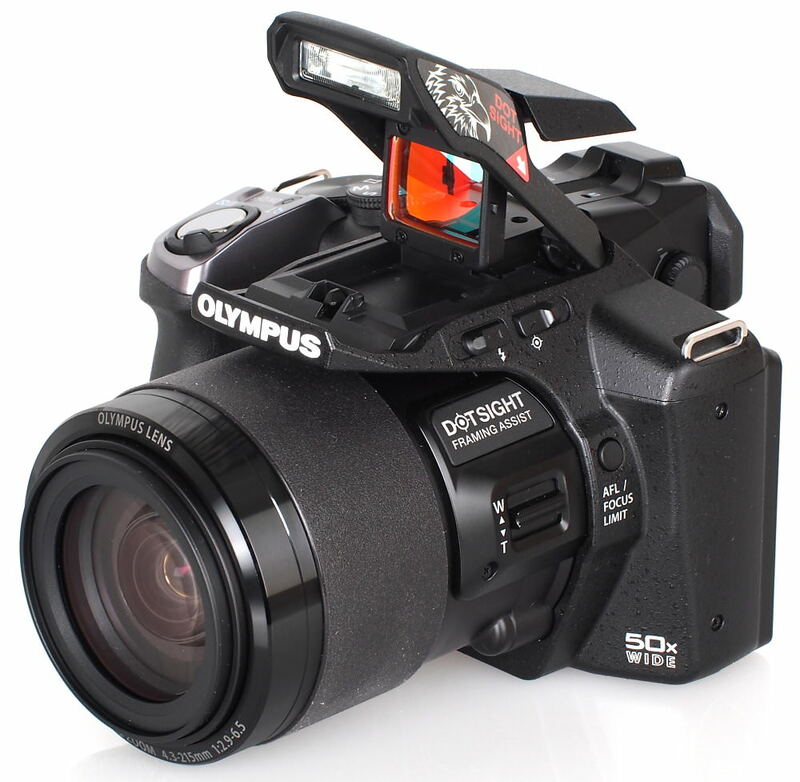 The Olympus Stylus SP-100EE offers a 50x optical zoom lens, a high-speed 16 megapixel sensor, a 3inch screen, an electronic viewfinder, and particularly useful when using the full optical zoom, has a new and unique feature to help you track your subject, called "Dot Sight". Dot Sight offers an effective optical viewfinder and targeting system when shooting distant subjects at full or near full optical zoom, and is a great addition to the ultra zoom camera. FullHD video recording is included at 60fps and the 5-axis hybrid image stabilisation will help keep your videos as steady as possible. The camera is well designed with a good level of grip and a number of external controls, in addition it is also good value for money. The only area where we would have liked to see better results is in the image quality department, as images are soft, particularly when using a lot of optical zoom. However, images have good colour and reliable exposure, so for sharing images on-line this may not be too concerning. 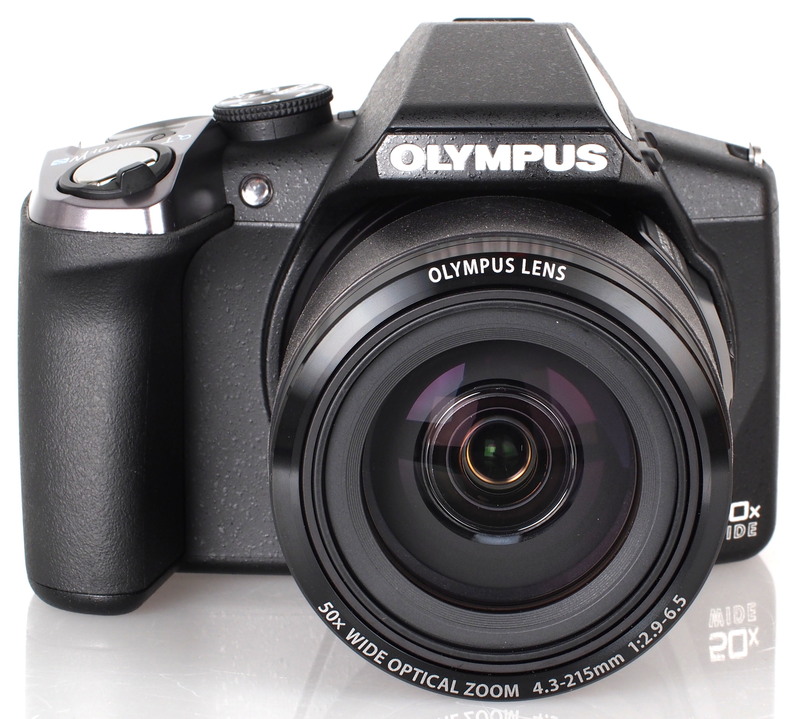 The Olympus Stylus SP-100EE offers a 50x optical zoom lens and an innovative Dot-Sight to make sure your photos are on target. How does this rate 4 stars? The IQ varies between diabolical and poor - overprocessed at best. The wide shot of the house looks like some smeared painting effect with terrible blurring and distortion. The Coolpix P600 reviewed at 4.5 stars and it's images are infinitely better than this thing. Sure that Olympus really make so much noise for nothing. Yeah Really the dot sight and the dot sight only are a interesting feature but that's all because the really important things are poor! The lens and the sensor, Actually my Smartphone can take better shots than this camera. Recommended? I don't think so. Who took these photos? You could do better with just about anything. I have one of these and the demo is nothing like typical at all. They really care for their camera, check the screen scratches, maybe the lens is the same. The "dot" sight is worth the cost of this camera alone for the type of work I put it to. Mainly wildlife at long ranges and high zoom. The picture is showing reflections from the table onto the rear screen. The screen is not scratched, as you can see in the following picture, showing the dot-sight raised. 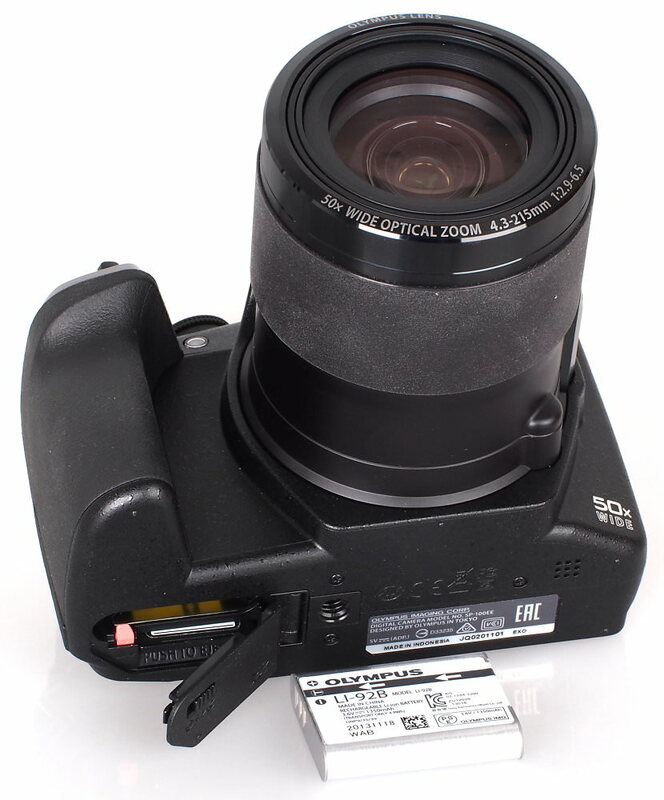 I recently purchased an Olympus Stylus SP100, and I want to mount filters on the lenses, but it appears there are no filter threads, has anyone had this same issue, and if so how did you solve it ?? ?